Action 1: Register for the SAT/ACT. You should start to schedule these tests now so that you have ample time to prepare for them. Each student is different, so a “testing schedule” is not one-size-fits-all. We typically recommend taking the SATs twice (perhaps in January and May) and the ACTs once (possibly in February or April) before your Senior year. It’s best to take the tests when you aren’t as busy with sports or clubs, so check out your schedule before you register. Not sure if you should take the SAT, ACT, or both? We typically give our students full-length, timed practice tests for both the SAT and ACT. Once we score those tests, we are able to make a well-informed recommendation. Again, every student is different so it is important to individualize testing schedule. Action 2: Work on your resume. Action 3: Visit colleges (unofficially). Scheduling guided tours of colleges is important. BUT you should also try to visit schools and take a self-guided tour to explore the campus on your own. This means going to the school, walking around, eating in the cafeteria, checking out the bookstore, etc. without a person from the admissions office giving you the tour. By going to the school and seeing it without someone sugar-coating every detail, you are able to establish your own sense of the campus. While you’re there, keep track of the things you like and dislike. This way, you will have a better idea of what you’re looking for when you do go on those guided tours. 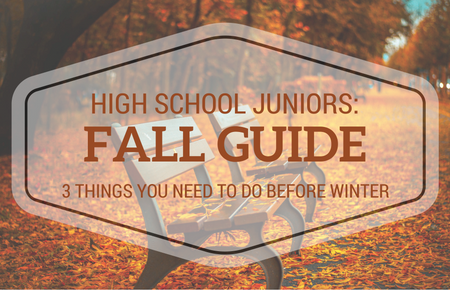 Getting started is the hardest part, but take action this fall and you’ll be much more prepared for next year!